As always, preparations for recent ANCIENT ALIENS interviews sent me on an incredibly exciting research journey. The producers of the show never fail to inspire me. In this case, we were discussing Japanese creation mythology and the historical accounts of Japan and its people’s creation by extraterrestrial beings. 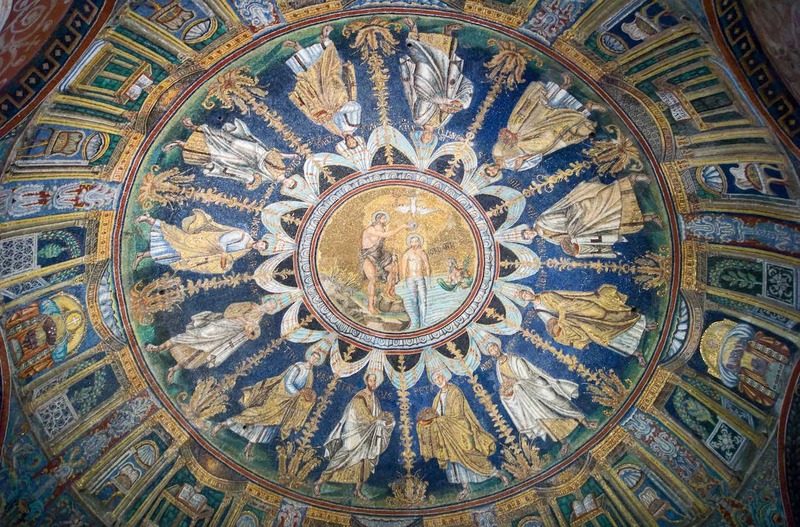 When I began my show prep I had no idea it would lead back to my beloved Ravenna, Italy and to a key lost piece to the Essene’s and early Christian mysteries of the light body, as well as an explanation for the cosmic symbolism of the robes of light of the angel-human hybrids. Follow me. It’s a deep dive, but you’ll love where this goes. Japan is highly unique in that its oldest indigenous historical written records date back to only the 8th century AD, as much of the Japanese tradition was passed down orally prior to this time. The oldest surviving texts, the Kojiki and Nihon Shoki, tell the creation story of Japan by otherworldly beings, and are considered to be official historical record by the Japanese. 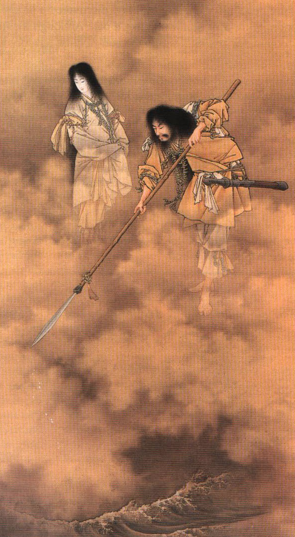 According to the records, before time, heaven separated from earth and the primordial gods came into existence, Izanagi and Izanami, humanoid celestial beings with snake tails, descended from the celestial Takamagahara palace, stood on the Ame-no-ukihashi or “Floating Bridge of Heaven” and stirred the primeval ocean with a jeweled spear. When they lifted the spear, the drops that fell back into the water formed the first solid land, an island called Onogoro. Izanagi and Izanami on the floating bridge of heaven. Izanagi and Izanami descended to the island and became husband and wife. They built a pillar of heaven with a palace around it. Izanami soon gave birth to eight lovely children, who became the islands of Japan. Izanagi and Izanami then created the many gods and goddesses we now know as kaki, as well as the human race. The heavenly jeweled spear was a gift from the elder heavenly gods. It was called Amenonuhoko. It sounds like some kind of hand-held nanotechnology terraforming device. Amaterasu (“Shining in Heaven”), is the principal deity of the Shinto religion was the daughter of Izanagi and Izinami. She is worshipped as the sun-goddess and ruler of the Takamagahara palace of the gods or the high plain of heaven. The Emperors of Japan are considered to be direct descendants of Amaterasu. The name, Izanaga, rings of the Nagas, a race of semi-divine serpent creatures in Hindu and Buddhist mythology. Female Nagas are called Nagis or Naginis. Usually depicted as human above the waist and snake below the waist, Nagas can also change shape to appear fully human or snake. Nagas and Nagis are known for their strength, supernatural wisdom, and good looks. They are capable of using their powers to shape-shift into humans, which is why the naga are sometimes portrayed as a human with a snake over its head. The half-human, half-serpent description also rings of Chinese paintings of Nüwa and Fuxi, a brother and sister who, according to a Chinese foundation myth, were the only survivors of a great flood. Charged with repopulating the world, Fuxi and Nüwa created vast numbers of clay figures, which they were able to bring to life with some divine assistance. The miraculous creation of humanity from “clay” is a theme that appears in numerous religious and mythological traditions. They all tell us the human body was a manufactured or made object. Like the Greek myth of Pandora, we are talking about celestial beings creating humans as inanimate objects and then animating them with divine assistance. What was the animating force? The Holy Spirit? Chi? How did they transmit into the newly created humans? A device? I filed this story in my Transhumanist file as the gods of Silicon Valley would like to know how they too can give life to inamimate matter. In the above image, Fuxi and Nüwa are holding a compass and a ruler (respectively), which are symbols related to the traditional Chinese understanding of the universe, in which Heaven is round and the Earth is square. Behind them are the sun, the moon, and various constellations, as a microcosm of the universe. The painting has several tiny holes along the edges, which are probably nail holes from when it was tacked onto a ceiling. Sometimes, the Nagas are winged serpents. In my work, I have posited the half-human, half-serpent symbolism as meaning these celestial beings as not only shape-shifting, but phasing between realities. They are spinning around an invisible cosmic axis into our web from another node in the fabric of creation. The serpentine body symbolizes the wormhole or cosmic conduit out which they are caught in the act of emerging into our realm. In my view, Izanami and Izanagi and Fuxi and Nüwa are strikingly similar to not only the winged serpent of wisdom of the Garden of Eden story, but also the ‘winged serpents’ or Seraphim angels of Judeo-Christian tradition, who were symbolized by the caduceus or entwined serpents wound around a rod or pillar. Like the Japanese and Chinese gods, the Seraphim descended from the celestial realms. Often, they are depicted holding staffs or ‘spears’. They were the guardians of the gates of Eden. They, too, are shape shifters. and the ability to fluidly morph or change form and to shape-shift. 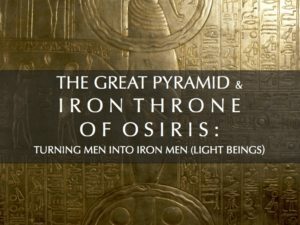 In the Old Testament we learn these angels mated with the daughters of men producing a hybrid race of beings known as Nephilim, or Giants, due to a cloak or garment of power they possessed. They also brought humanity technology and taught us the secrets of heaven. God sent the flood to destroy these beings. In one of my unique theories, I have linked the symbolism of the Seraphim’s swirling light bodies to the Tibetan thangkas in which we see the guru, Padmasambhava, with a serpentine face and a swirling body of rainbow light. This rainbow body or coat of many colors spins from within. His threads are woven of truth and light. The Tibetan paintings show a face-on view of Padmasambhava morphing or phasing between realities in a circular, plasma-like orb. To me, the paintings of Nuwa and Fuxi show this same morphing from a side view. In my opinion, the Rainbow Light body answers the description of the angels because these angels have (plasma) bodies of rainbow light. Another description of Nüwa and Fuxi and their tools is found in a book entitled The Magic Square: Cities in Ancient China by Alfred Schinz, who notes that it appears from these legends that civilization, i.e. ordered human life, begins with two personages, both portrayed as being semi-human and with mermaid tails. Nüwa and Fuxi, originally sister and brother, later became wife and husband after they had invented proper marriage procedures and family names to prevent marriages between people from the same family. Nüwa, in her own legend, had restored order between heaven and earth after a horrible catastrophe had caused heaven to tilt to the north so that it no longer covered all of the earth. This may refer to the first observation of the oblique elliptic and the angle of the pole star. Nüwa found it necessary to reestablish the four cardinal points, which she did, thereby creating the prerequisites for further observations. In the oldest pictures of her she carries a compass, the instrument related to heavenly observations. Her brother Fuxi became the first legendary emperor, which also implies the establishment of government, of law and order…by an extraterrestrial being. On another, more practical, level he is said to have invented axes for splitting wood, the carpenter’s square, ropes for hunting and fishing nets. It is worthy of special attention that the two words for compass and square, gui ju, used together denote – the rule, custom and good behavior, i.e., keeping order. Again, order is the gift of these gods. Scholars say the compass-square dichotomy/unity is similar to the heaven-earth, yang-yin, relationship, which in this case means that man (Fuxi) establishes harmonious order between heaven and earth. This is also expressed in the Chinese character for king, wang, the upper and lower line indicating heaven and earth and the middle line man, all three connected by the vertical line. 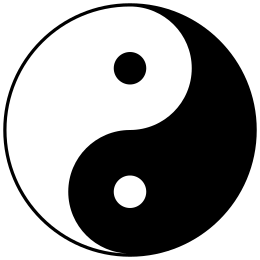 This represents the position and function of the ruler; it is he who establishes and keeps order by placing himself in a balanced and harmonious position between heaven and earth, so that yang and yin cooperate in a beneficial way. Furthermore, it should be observed that the male-female system, the yang-yin philosophy, is expressed here in a complex manner, first as Fuxi and Nüwa, second as compass (male) and square (female), and third as Nüwa (female) with compass (male) and Fuxi (male) with square (female). Since Antiquity, the square has represented the physical body. The circle, on the other hand, has always represented the soul. The square and compasses thus symbolize Man’s state as an eternal soul manifesting in a temporary body. Noted by Mark Edward Lewis in Writing and Authority in Early China, these symbols were used to represent cosmic order, a link between heaven and earth, and a favorable environment for the deceased. 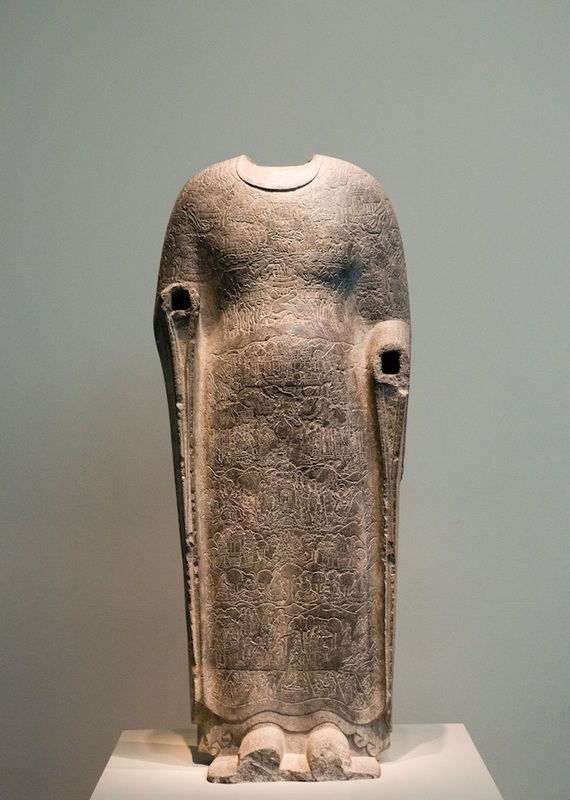 This role of linking Heaven to Earth also figures in the depictions of Fu Xi and Nü Wa. First, in Han tombs their elongated, serpent bodies stretch from the bottom of the register to the top, and in later depictions this vertical ascent becomes even clearer. In Sichuan sarcophagi they play the iconographic role of the dragons on the Mawangdui banners who physically link the earthly realm to that of Heaven (here is my article on the neuro-scientific basis for this practice). This idea is reinforced through the regular inclusion of two other iconographic traits, says Lewis. Fu Xi and Nü Wa are often depicted with the sun and moon, and they are shown holding a carpenters square (Fu Xi) and a drawing compass (Nü Wa). The former are metonyms for Heaven and the celestial equivalents of yin and yang. The latter suggests the linking of square Earth to the round Heaven. Most scholars agree that the role of the intertwined Fu Xi and Nü Wa was to depict the interaction of yin and yang that underlies cosmic order and thereby secure an auspicious environment for the denizen of the tomb. 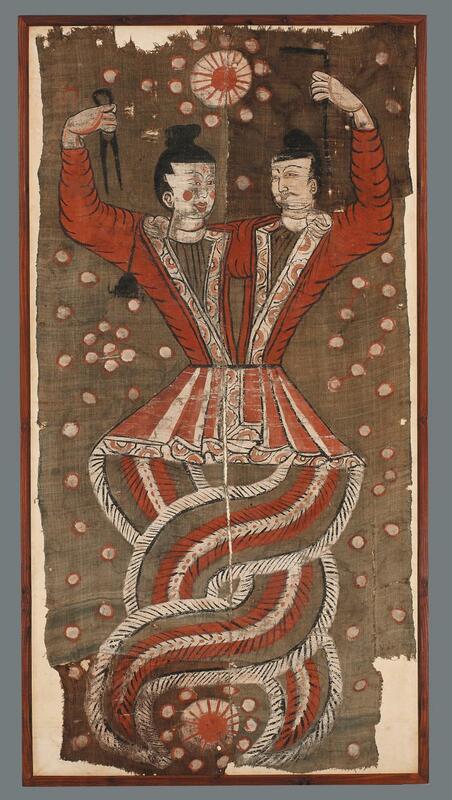 My search for images of Nüwa and Fuxi led me to the blog of Bryce Hayman, who noted that these two figures are almost always depicted holding the same symbols in their hands, and which have been described by many different scholars as the tools of creation and divine order. In Chinese cosmogonic art during the Han Dynasty (206 B.C.E.–220 C.E.) two royal creator deities were depicted holding architectural implements that were used in the formation of heaven and earth—the compass and set-square. In a funerary context these beings served as “doorkeepers” or “guardians of boundaries” who “marked the division between inner and outer” spaces (as found in Genesis 3:24, Exodus 26:31). The Chinese deity who was shown holding the compass was associated with bringing “ordered space out of the chaos of the flood” (cf. the Hebrew concept) while the other, who held the square, was “credited with the invention of kingship” . Proverbs 8:27 tells us that God used a compass as part of creating the heavens and earth. 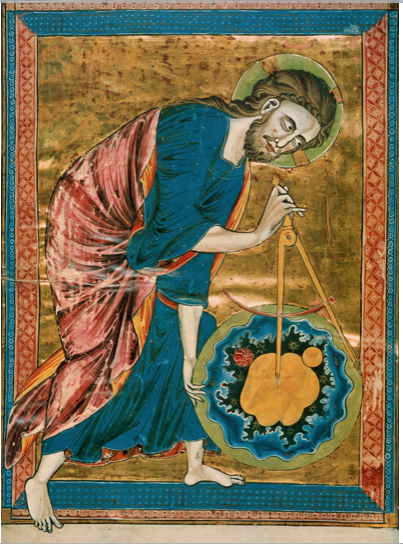 The compass and square are the tools of creation. They symbolize a moral code, as well. Freemasons, who identify themselves with these symbols, point to ancient China as the place of origin of their craft symbols. The letter “G” is found in the center of the square and compass. It stands for “God” or the Great Architect of the Universe. 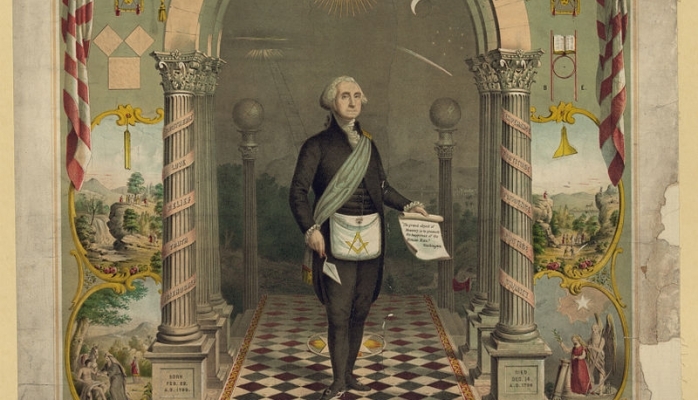 George Washington, Freemason, wearing compass and square. A ladder extends from his shoulder to a ‘rainbow gateway’. Importantly, in Hermeticism the Great Architect is a metaphor that alludes to the godhead potential in every individual. It expresses the quantum view that we create our own reality; hence we are the architect of the universe. As we will see, it was adopted by early Christianity as a symbol for the Shining Ones. If we take the aforementioned Chinese stories at face value, these symbols represent the original, perfect, teaching of the celestials. They symbolize the ‘craft’ of the gods, who used them in the formation of our bodies and our reality. They represent the cosmos and the means to harmonize with it. They represent the yin-yang, male/female duality within us. The compass makes the circle and is feminine. When we harmonize these two twisting serpents or currents within us we achievement at-one-ment with all that is. More, they represent heaven meeting earth and the way to enter the cosmos. This is why the are found on Chinese burial banners or burial shrouds. They are talismans for good luck and reminders of the rules of the cosmos in the afterlife. Hung from a ceiling (as the nail marks indicate), these veils would have become ‘portals’ to the afterlife. Now, we are ready for the astoundingly powerful and fundamental revelations of Mormon scholar Hugh Nibley. In 1975, Nibley gave a lecture on “Sacred Vestments” that is simply mind blowing. The vestments are the white linen garments worn by the early Christian apostles. The tie-in here is that the L-shaped symbol of the square is on these vestments. 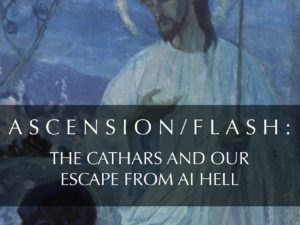 Nibley noted that the apocalyptic writings of the Jews and Christians have a great deal to say about certain holy garments and their nature and significance. What they say is in close agreement with the oldest writings of the Egyptians and Babylonians. The Pistis Sophia tells us that forty days after the resurrection, Jesus spoke to the disciples. He formed a prayer circle with his “disciples and their wives, stood around behind Jesus, who himself stood at the altar, thus facing, as it were, the four corners of the world, with his disciples who were all clothed in garments of linen.” Jesus proceeded to give the prayer (Pistis Sophia IV, 353:16-22). The Pistis Sophia says it derived from the Second Jeu, a book written originally by Enoch and then hidden up in the cleft of a rock (Pistis Sophia II, 247:4-7). Second Jeu says: “All the apostles clothed in linen, garments…formed a circle, foot to foot, and Jesus, taking the place of Adam, proceeded to instruct them in all the necessary ordinances. The point is when they formed a prayer circle, they always mentioned “clothed in their garments” or “clothed in white linen”. The next day he says: “After you have put off the old garments and put on those of spiritual white, you should keep them always thus spotless white. That is not to say you must always go around in white clothes, rather, that you should always be clothed in what is really white and glorious”. This, he says, is the fullest of early Christian references to the vestments. More, a full description of the complete garments is found in the Testament of Levi from the Testaments of the Twelve Patriarchs. Levi goes to Beit-el (the House of God), and there he says, “and I saw seven men, clothed in white, who said to me, ‘arise and put on the stole” (8:12). This stole was said to be leather and is associated with Pericle’s lion skin that he always wore, and also the leopard skin which an Egyptian priest must always wear over his shoulder. It protected Pericles when he went through the world on his 12 labors as the benefactor of the human race. Cats and stars go together in the garb the Egyptian priests. 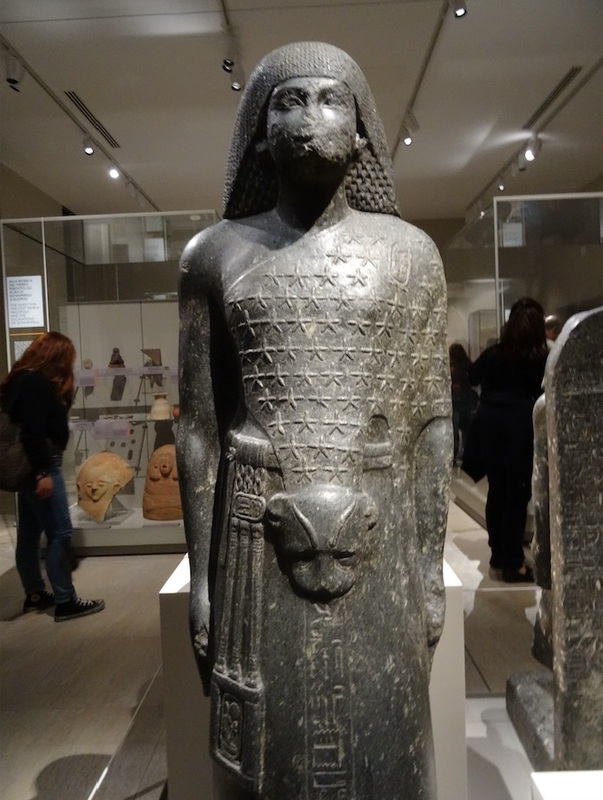 Egyptian Museum, Turin, Italy. ©WilliamHenry. There were additional items, too, says Nibley. First, there was the stephan, anything that surrounds or encircles the head — crown, wreath. There was the logian tes syneseos, that is, the oracle-breastplate. There was the podere, a long overall robe that hung down to the feet and went over one shoulder. This is the basic robe of truth. There was the petalon, made of olive leaves. Next came the girdle called mitra, a band of sindon, a symbol of strengthening. Last of all he received the ephod of prophecy. Each of the seven angels, the seven men in white, as he placed an item of clothing upon Levi, said: “From this time, thou art a high priest of the Lord, thou and thy seed after thee, for all eternity. And the first anointed me with holy oil and gave me the staff of judgment. And the second washed me with pure water and gave me bread and wine in the Holy of Holies, and placed upon me the holy and glorious garment. The third placed about me a linen robe like an ephod, and the fourth put a girdle or sash about me like a belt. And the fifth gave me the olive branch of prosperity, a flourishing state of body, and the sixth placed a stephan around my head. The seventh one tied on the stephan on the shoulder and he filled my hand with incense material to show that I was to serve as a priest of the Lord. 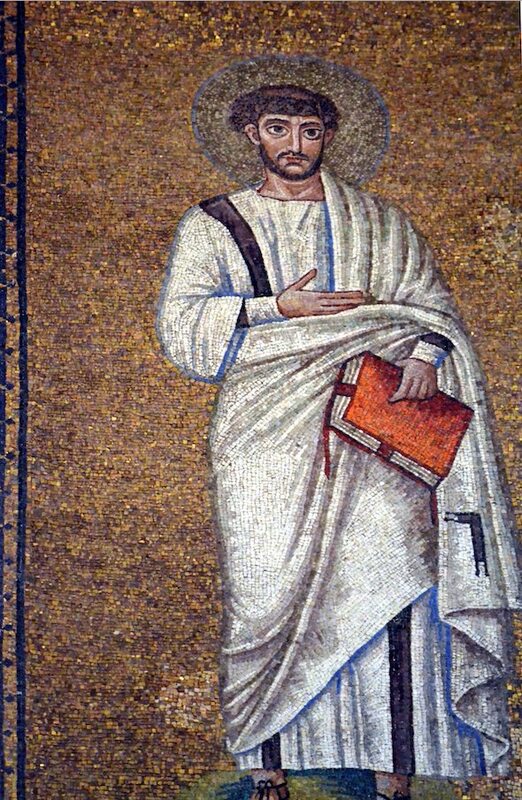 In the Wisdom of Solomon: “For upon Aaron’s long high-priestly robe was the whole world pictured, and the glories of the Father were engraved upon the four rows of precious stones his majesty” (18:24). The Zohar tells us that the same marks were in the veil of the temple which was covered with stars. This cosmic symbolism is also found on the robe of the Buddha. It describes his journey, and safe passage, to Meru. 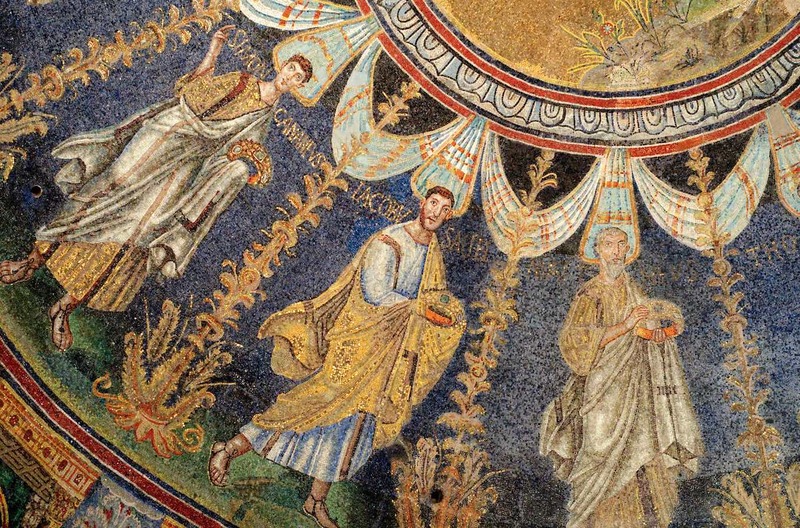 As Nibley observes, marks are found in many of the famous mosaics in Rome, Ravenna and Naples, especially from the 5th century AD and later (but earlier also). One can see that all the mantles of the Biblical figures are depicted with a single pattern similar to the Greek gamma, a symbol with a right angle, or L, and square. 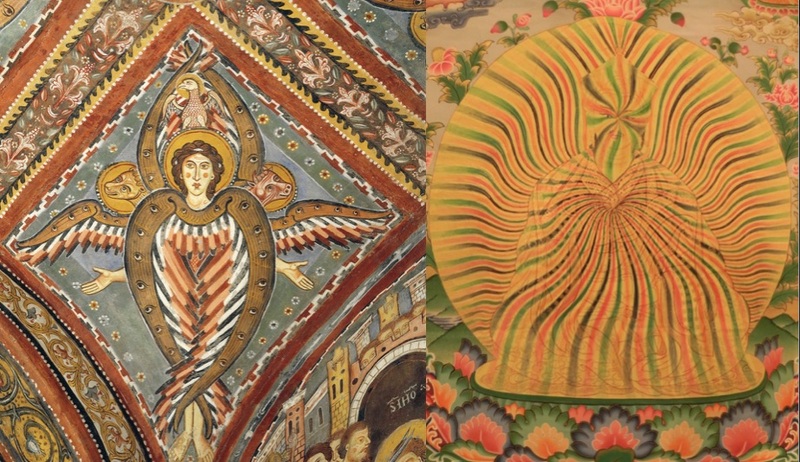 The best examples are from Ravenna from the 4th century. These show heavenly figures wearing white robes with the gamma or gammadia. Holy people, especially, have this mark. The pattern is on the edges of the robe. They are common in early Christian art. Detail of the ceiling mosaic of the Baptistry of Neon. Ravenna, Italy. An apostle wears the ‘L’ of the Shining Ones. Discovered around 1913, the Coptic Bartholomew says Adam and Eve had certain characters or marks written upon their garments as signs of the Holy Ghost. They are written in seven places. Remember, when the temple was destroyed, the priesthood went, and the robes of the priesthood disappeared (or their ministrations), so they don’t bother about that anymore. When this knowledge was lost the garments became purely allegorical. 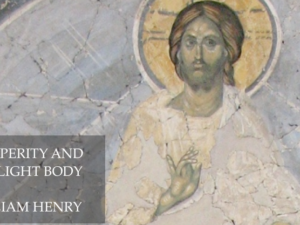 Constantine at Nicea is a good example of that, says Nibley. His garments were completely encrusted with jewels. So, says Eusebius (Life of Constantine, III, 10) when sunlight hit him — it was carefully prearranged that sunlight would hit him when he stepped out and appeared before the assembly — you would have thought it was an angel of heaven. He was painted up like a doll, his face all painted like a mask, and he moved like an Egyptian pharaoh. 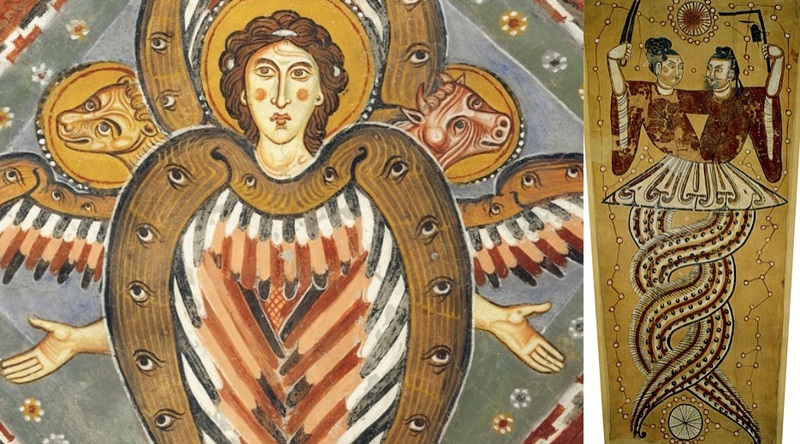 As Nibley notes, the use of the “gammadia” symbol in early Christian art has raised some controversial issues, mainly that art historians throughout the ages have refused to acknowledge any meaning to this symbol and that its usage is strictly ornamental. This despite the fact that the gammadia or carpenter’s square is symbolic of the gnomon, time, space, and math. 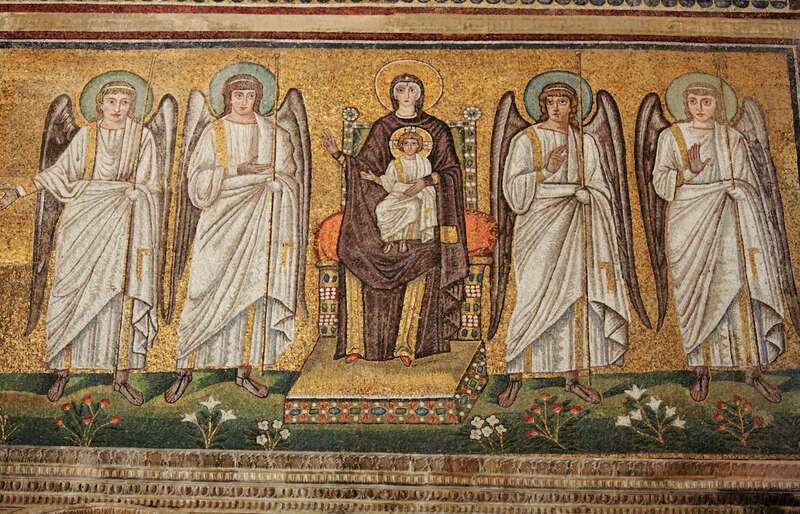 The gammadia’s use on several hundred mosaics throughout Italy but especially in Ravenna over the course of five hundred years (between 350AD and 850AD) has been very consistent: the symbol only appears on clothing, altar cloths, or altar curtains to identify people or things of religious significance. Jesus, enthroned on the lap of Mary, wears the ‘L’, as do the angels. The gammadia appears on the clothing of Jesus, the apostles, evangelists, and others who had status within the church. Furthermore, it is well documented that Popes during the Italian Renaissance had an obsession for Egyptian obelisks, another representation of the venerated gnomon. Therefore, says Nibley, the symbolic role of the gnomon and carpenter’s square is consistent through out Christian art and architecture. Goodenough, in his study of Jewish symbolism, discovered that in Christian art the garment and robe were marked with signs at right angles, the gamma or square, or simply with a straight bar with prongs. He concluded that the marks had some religious significance or symbolic force. In my view, this is the logo or brand of the ‘L’s. The Els are the Shining Ones. In the Pistis Sophia, a Gnostic text of great importance, the garment is marked with the sacred Name and with five mysteries. One symbolically puts on Christ, in Gnostic speculation, through receiving baptism and the garment. The ancient garment was known to the Essenes. As Nibley notes, among the textile fragments excavated at Masada were the remains of pieces of fabric with L-shaped cloth markings affixed to them. Dating to before A.D. 73, these are among the very earliest known examples of such marked garments. Scholars refer to these markings as gammadia, some of them being shaped like the Greek letter gamma (G). Though similar patterns have been found in several locations, the significance of these markings remains unknown to archaeologists and art historians. Because these markings seem to appear artistically in conjunction with the Essene hope for life or glory after death, their presence on the clothing found at Masada may reflect something about the religious hopes and convictions of the Jewish fighters. Each step of progress in initiation was marked by some change of the garment or robes, and so the symbolism of the garment implied increased glory, moving from one existence to another. This is exactly the same meaning as the Chinese paintings of Nüwa and Fuxi. As noted, the symbolism of the compass and the square has these two as its extraterrestrial source. 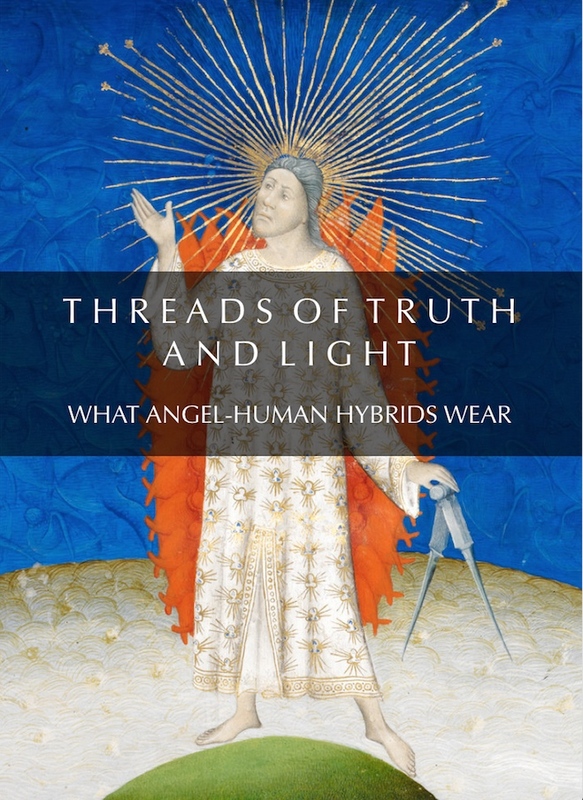 The fact that the holy ones and the angel-human hybrids wear threads of truth and light emblazoned with the L or square tells us this teaching wove its way into Christianity. Only now, we know the rest or the story. Its interesting to see in the images that they are all using different mudra hand positions which may reveal more information about what they are conveying. Thank you for a great article. The “L” on the mostly white robes, the square, LOVE, LIFE, LIGHT, EMANUEL…. 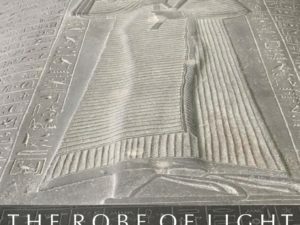 man/soul manifested from God, as all things (EARTH) are manifested from “the light beyond light/love vibration/(HEAVEN/CONSCIOUSNESS).” Putting on the new robe, to me, is conscious of the consciousness – the amazing gift that separates “manifested man” from other sentient beings. What a great gift – to be conscious, to create and to be aware of the awesomeness of God – we are here to acknowledge and expand his Glory/Light and art/symbols and artists are our wayshowers. Thank you. Second Jeu says: “All the apostles clothed in linen, garments…formed a circle, foot to foot, and Jesus, taking the place of Adam, proceeded to instruct them in all the necessary ordinances.” I would sure like to know those ordinances..perhaps change the word ordinances..to exercises..and learn the exercises Christ was teaching them..I would bet many white linens..these same exercises would be daily performed by almost all animal species on the globe. Know Thy (Light)Body! Excercises of purification, from the inside out, I imagine.